Slim & Sassy Metabolic Blend is predominantly used internally, but did you know that topical application of this proprietary blend also boasts amazing results? One of our favorite ways to use Slim & Sassy topically is in combination with dry brushing – the act of brushing over dry skin. It is a natural health practice that stimulates the connective tissue attached to the capillaries sitting under the skin, which assists the lymphatic flow around the body ridding the body of toxins and waste and improving circulation. 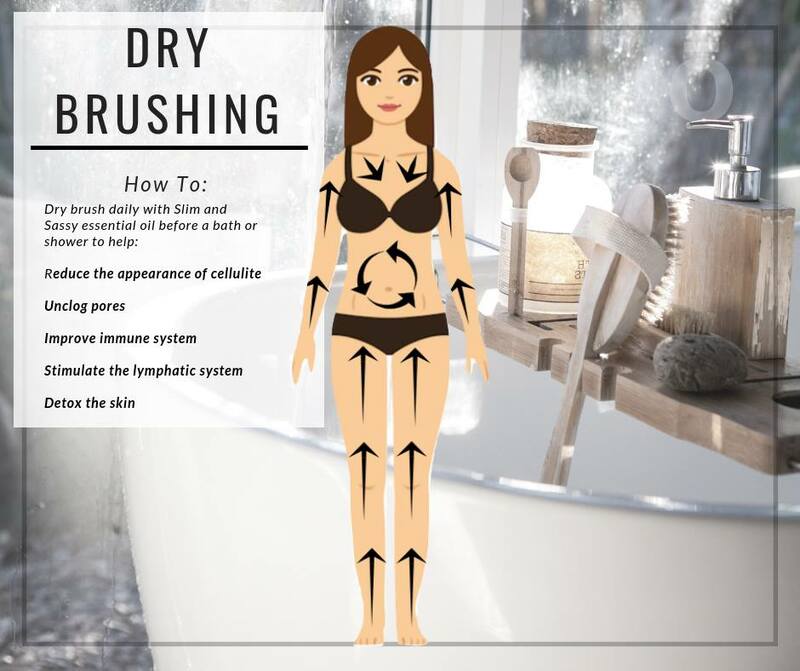 Research also suggests that dry brushing helps reduce cellulite by speeding up metabolism, which helps break down fatty deposits or toxins within the bloodstream that often cause cellulite. Regular dry skin brushing exfoliates dry, rough skin, enabling moisturizing products to more readily absorb into the skin, assists with stimulation of sweat and oil glands, contributing to the restoration of moist, supple skin, strengthens pores by assisting with increased skin tone, and gently stretches connective tissue to help regenerate production of collagen and elastin fibres. Enhance these amazing benefits with the addition of Slim & Sassy Metabolic Blend to your dry brushing regimen! Click Here to Order Today’s BOGO at a Discount! Buy OnGuard Get Slim and Sassy Free! If you’ve been thinking about purchasing a starter kit this is the perfect time because it will include your wholesale membership to save an additional 25% off the BOGOs happening this week! (there are no obligations, no min purchase and no selling! There is also an additional promo on the home essentials kit that will give you a FREE bottle of red mandarin AND serenity. **Choose the Wholesale Customer option to purchase doTERRA at 25% off for a full year whenever you want to shop. **Choose whichever starter kit (or you can just set up your account for $35) you’re drawn to and add any additional items at the 25% off price to your cart. The Home Essentials kit or Family Essentials Kit is the most popular (Here are the Canadian and US kits) Note – if you’re purchasing your kit during BOGO week, you can add the BOGO item for that day to your cart along with your kit purchase. As soon as you’ve completed the steps above, email me at April@EssentialOilPrincess.com so I can send you an amazing welcome pack and add you to my Exclusive Education Groups. I am excited to help you on your journey with essential oils!